As with so many classics, The Third Man’s ginormous reputation (#1 on the BFI’s Greatest Films list is no small feat) precedes its real merits. People who watch this film only based on the name might be disappointed; compared to the philosophical profundity of Citizen Kane and the sentimental charm of Casablanca, the story of poor Holly Martins seems almost too ordinary. 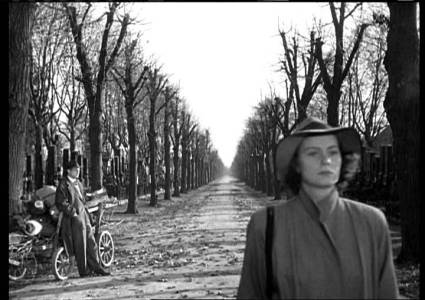 But all the good things The Third Man has instead – a chilling, gorgeous film noir atmosphere; a magnificent portrait of post-World War Europe; a catchy zither score; surprisingly fresh and affecting characters – still makes it a real treasure. It’s one of those special films that gets better every time you watch it. Based on a novella by the peerless Graham Greene, The Third Man opens up on the ruins of post-World War II Vienna. The artistic glory that once graced this city of Strauss, Mozart and Beethoven has barely left a mark in this brutal, Cold War reality. With the city completely occupied by the conquering Allies and little hope for economic or cultural recovery, the black market has all but taken over the day-to-day lives of ordinary Austrians. It’s this seedy side of the “City of Music” that surrounds the toils of protagonist Holly Martins (Joseph Cotten), a struggling American pulp novelist who touches down in Vienna at the behest of his old friend Harry Lime (Orson Welles). When Martins arrives in the city at the start of the movie, he finds out that Lime was hit and killed in a car accident that same morning. As a result, instead of having a happy reunion and catching up with his long-lost buddy, Martins finds himself attending a funeral, getting drunk on grief, and getting punched in the face by the resident British army representative, the disdainful Major Calloway (Trevor Howard). So much for enjoying his time abroad. After talking to Lime’s apartment porter (Paul Horbiger) and a few of Lime’s sleazy friends, the so-called “Baron” Kurtz (Ernst Deutsch), the “Romanian” Popescu (Siegfried Breuer), and “Doctor” Winkel (Erich Ponto), Martins notices a discrepancy in their stories about Lime’s fatal car accident. Kurtz, Popescu, and Winkel all firmly claim Lime was carried off the road by two men and died a few minutes after the hit. The porter, however, claims that three men carried Lime’s body and that Lime died immediately. It’s a small, almost trivial divergence. But Martins, near-broke and marooned in Europe, doesn’t have too much else to ponder in his life. When the porter is mysteriously murdered just hours after he gives Martins his version of the tale, Martins gets even more motivated. He decides to become an amateur detective and find out the truth behind what he suspects was his best friend’s murder. Along the way, he meets and falls for Lime’s girlfriend Anna (Alida Valli), a Czechoslovakian on the run from the Soviets. Eventually, after many hapless adventures together in the streets of Vienna, the two of them end up discovering that there’s far more to Harry Lime than the official story. Like every great movie, The Third Man has several layers of complexity. At the most basic level, it’s a classic story about friendship and betrayal. One man idealizes another, but facts unravel that perfect image. He remains in denial, but the facts keep presenting themselves. At the end, he reluctantly decides to turn against his former friend. A classic story that could easily turn melodramatic (remember Anakin and Obi-Wan? ), but to which Greene and director Carol Reed have instead given their unique, properly dramatic spin. Particularly with Lime, who doesn’t appear until over halfway into the movie. He’s talked about, discussed, and criticized nonstop by everyone, but we never once see his face or see him talk. The atmosphere and tension Reed creates thus – we feel Holly’s idolization as much as we hear about it – gives way to probably one of the most memorable introductions in film history. In an alley, a drunk Holly yells at a mysterious figure lurking in the shadows across the street. When a light suddenly turns on from above, Lime’s smirking face emerges from the shadows. He’s still alive. The biggest reason this tale of betrayal carries such weight lies in the man who plays Lime, the inimitable Orson Welles. Welles’ performance is probably the most brilliant ever given in such a short amount of screen time. He appears and talks for a mere five minutes, yet the impression he leaves is absolutely indelible. He’s magnetic evil like you’ve never seen it, the smooth-talking villain who makes killing babies and poisoning unsuspecting black market customers sound like the high road. Your mind reels at the ruthless manner with which he casually dismisses little “dots” of people on the ground, but your heart finds itself completely disarmed and hooked by his pure, almost innocent joviality and boyishness. Small wonder Holly has qualms about joining Major Calloway’s “Capture Lime” operation at the end of the movie. He, like us, has been hypnotized by Lime’s screen power. Add the memorable (if historically inaccurate) quip about Italians, the Swiss, and the cuckoo clock, and you’ve got a sterling performance that overshadows every other aspect of the film, all of which are already top-notch. To think that Welles did the role just for the money. Welles’ screen power easily clears the entire field. But Alida Valli and Joseph Cotten also deserve credit for their under-appreciated performances. Without any mushiness, Valli succeeds in portraying the essence of Lime’s grieving lover. Anna is tough, cynical, and unafraid to call Holly out on his antics. Beneath the impassive, stern facade she wears throughout the movie lies a wounded, grieving heart, fiercely loyal to the memory of Lime even after death. To Anna’s jaded eyes, the purported misdeeds of Lime mean little in the wake of a war where nobody, not even the purported “good guy” Allies, could completely maintain the moral high ground. She’s a spirit sick of the world, resigned to her inevitable capture, yet clinging fastidiously to what little purity she can find in the waste land of her world. Valli embodies all these extremes of emotion with unbreakable, moving poise. Thanks to her, Anna’s defiant resistance to Lime’s eventual capture comes off as totally believable. And Cotten as Holly Martins never misses a beat. His role is trickier than it looks – after all, he has to play a protagonist who, through no fault of his own, comes off as unlikable. Martins is a character that encapsulates the hypocrisy and aimlessness of the dark, pseudo-advanced Europe Greene captures with such sting in the screenplay. He’s clumsy, awkward, passive, dimwitted, and hard to take seriously. The many scenes in which he stumbles – he gets bitten by a parrot, completely bombs a lecture he’s supposed to give on “literature,” and can’t even admit to Anna’s face that he likes her – provide a cutting counterpoint to the supposedly noble nature of his investigation of Lime. He’s a man with good intentions gone to waste, a poor cog in the machine of the real world. Cotten will make you laugh and face-palm with the marvelous way he plays up the cluelessness of his character, a person who falls apart the minute he steps beyond the confines of his pulp-novel world. The studied pettiness of his Martins only further accentuates the irresistible charm of Welles’ Lime. Beyond the main actors, Reed has applied the ideas and techniques of film noir to create a dark world teeming with criminality and amorality. I could make a whole list of all the memorable ways he uses shadows and slanted angles to make some of the most creepily beautiful shots you’ll ever see. These are alleyways, pipelines and run-down apartments that together provide a haunting portrait of a civilization struggling to move out of the morass of the early 20th century, a topsy-turvy, inhuman world where the “bad guys” don’t seem all that bad and the “good guys” are the least compelling personages around. The fact that the most famous sequence in the movie takes place in the Viennese sewers, a world of shadows and dirtiness, serves as a literal manifestation of this movie’s desolate outlook. Forget what you think you know about World War II and the “glorious cause” of the Allies. The Vienna shown here is the stuff beneath all the glitter. Finally, no discussion of this movie is complete without a mention of the distinctive zither score. Reed allegedly bumped into the score’s composer, Anton Karas, completely by chance in a Viennese bar. What a lucky find. The folksy feel of the zither, which provides an oddly happy-sounding backdrop to all the events, doesn’t seem to initially jibe with the comparatively dark plot. But the way it lightens the atmosphere, the way it makes us think of happier, laid-back times that, alas, don’t seem to be anywhere near those of the plot, serves the satiric nature of the story very well. At times, it even seems to be mocking the stupidity of Holly’s actions. A disjointed add-on, in other words, that only furthers the vitriolic nature of the bleak message Greene wishes to convey. It keeps the movie pleasantly wistful and viciously sharp all at once. There’s so much more to be said about the marvels of The Third Man. But in the end, it’s a movie whose unique blend of satire, comedy and tragedy defies explanation. You have to see it – several times, perhaps – to appreciate the layers of thought that went into it. Whether it’s the film noir or the acting or the dialogue or the worldview of Greene, The Third Man remains a thought-provoking, wonderfully entertaining film even to this day. And, on a random side-note, one of the only old movies where the main lead gets brutally friend-zoned instead of kissed. Based on Graham Greene’s 1949 novella of the same name.